Choosing between Latigo, English Bridle, and Harness leathers, the main difference between the three is oil content. English Bridle has the least amount of oil. 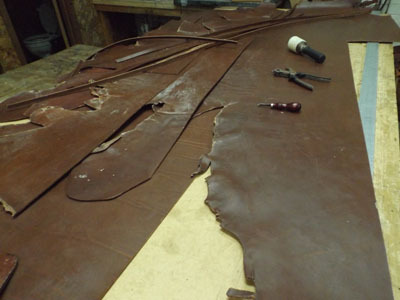 This is evident when working with the leather as it has a drier feel to it. It needs treatment to make it more weather resistant. The Latigo leather has a little more oil, which is evident in the working of the leather. The reason for the differing oil content is simply purpose. Latigo is used as strap leather such as strapping the saddle to the horse and therefore needed to be slightly more weather resistant than English Bridle, which is used in bridle making. Harness leather is best because it is meant to be the most weather resistant. Harness came into closer proximity to horse sweat therefore it was subjected to getting wet on a daily basis. It is stuffed with additional waxes and tallows that impregnate the leather with its weather resistant property. Harness leather is a little heavier, but with the extra oils and tallows it makes it the best choice for outdoor use. This leather duck strap is supperior in every way and in our opinion there is no better leather duck lanyard. If you would like your duck tote personalized let us know. During checkout go to the comments box and explain what you want. This service is free!